Perfect ambiance. Complete with swinging chandelier. 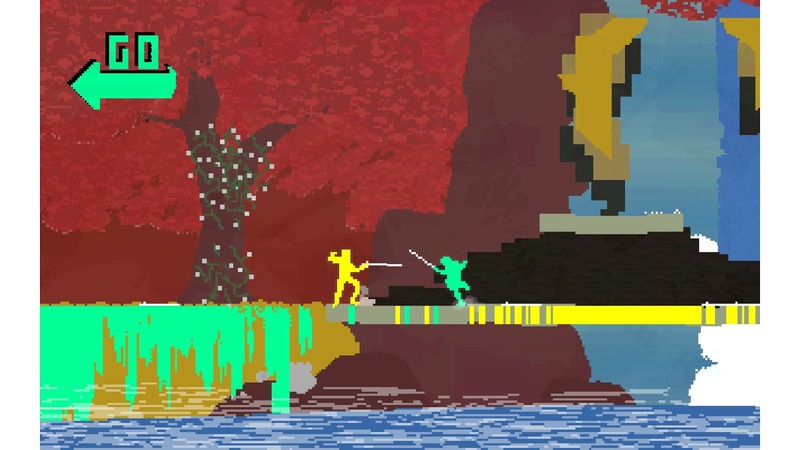 For two years I have been following the progress and aching to play a little indie game called Nidhogg. It's won several awards and was a finalist for the Grand Prize IGF award at GDC in 2011. It's a simple concept executed perfectly. Two swordsmen compete to gain ground and the first to reach the opponents goal line gets eaten by a dragon thing. The graphics are very simple, made to mimic the look of an old Atari 2600 or NES. It doesn't take long to learn and not only supports, but recommends local play. Through the magic of the Steam Summer Sale, I grabbed a copy on the cheap. It was the best purchase I've made this year. 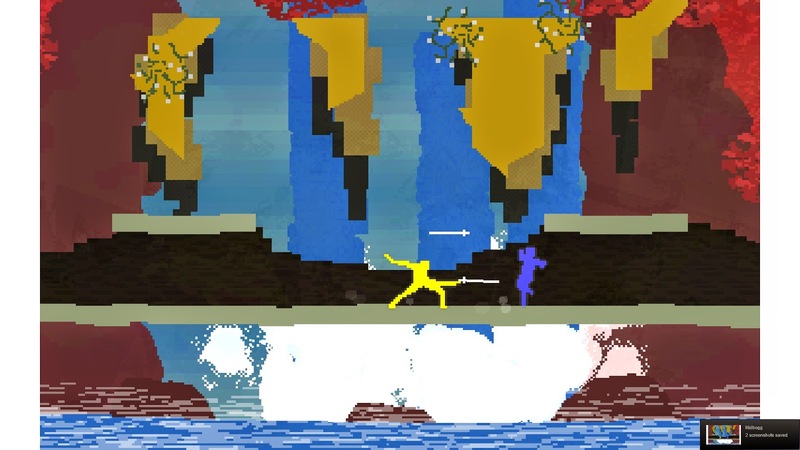 Nidhogg immediately won me over when I stumbled on an article from Rock, Paper, Shotgun in 2010. Mark "Meshoff" Essen built the game in GameMaker 8 (Now GameMaker: Studio). Since that early build and the number of accolades it's received, not much has changed in the mechanics of the game. There's only one button to attack and jump. Movement is pretty basic, mostly left and right and a crouch. Combining these basic controls allows for a surprising amount of depth to the moves. While little has changed from it's original version, the upped speed, fine tuned backdrops and new sound effects add a lot to the atmosphere. Snapping your opponents neck has a particularly visceral sound that always makes me cringe a bit. The fabled disarm. It's a lot harder than you think. Each match can be unpredictable, some lasting less than a minute and others stretching longer than half an hour. In that time any number of fights can be won or lost. Desperate gambles are a staple of any game, and hilariously jumping over or rolling past an opponent and running for your life is a common occurrence. It's also common to receive a thrown sword to the back of your head when executing this strategy. The game awards movement rights to the last player to get a kill (or not fall off a cliff). Seeing someone turn a game around while on their last screen is amazing, no matter what side of the fight you're on. That's right. Run right into my waiting blade. 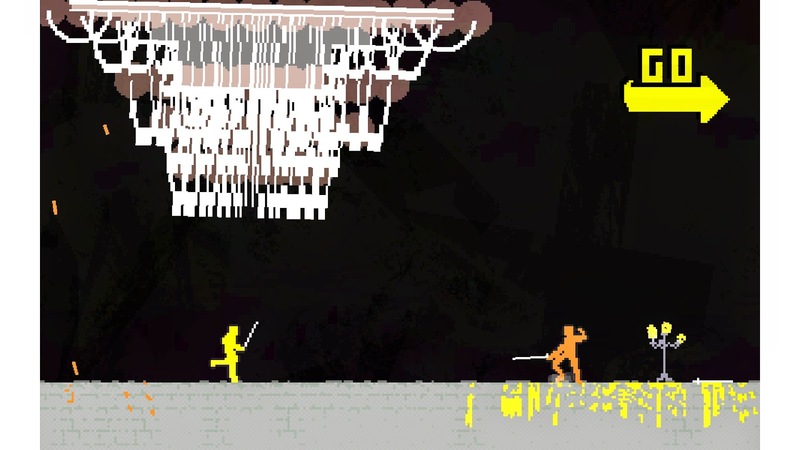 Nidhogg has managed to distill the fun of arena games to it's pure form. Sitting in a room full of friends and setting up a tournament has been one of he best gaming experiences I've had in a while. The whole room really lights up during a match, and people tend to get really excited, even when they're just watching another players match. It's an infectious energy that makes you want to play again and again, no matter how late it may be or how soon you have to be to work the next day. I can't think of a single part of this game I dislike or would change.If you pick up Nidhogg, I suggest throwing a party to christen it. It only gets better with more players.